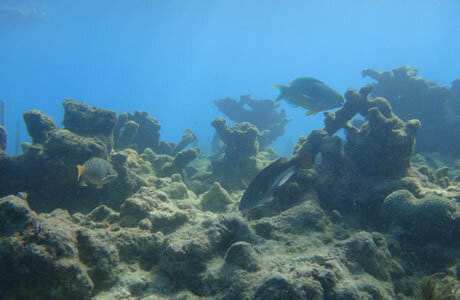 Ten-Fathom Ledge is an intriguing dive site which is approximately one mile southwest of Western Sambo at N 24 25 58 W 081 57 01 in the beautiful waters surrounding the Florida Keys. This dive site includes many interesting features to explore including outcroppings, ledges, and caverns. There is a substantial drop-off where the coral reef wall drops from 50 feet to 115 feet. The average depth is just 40 feet, however, making the site accessible to intermediate divers. The Gulf Stream nearby does produce a strong current. On one hand this can make diving more difficult, but on the other it does provide for great visibility throughout most of the year. The clear water makes it easy to see and photograph the marine life that inhabits this area. You'll see many species of fish including large groupers. You may also meet spiny lobsters, eagle rays, and even sharks. So this is a particularly exciting area as far as sea life is concerned. The Ten-Fathom Ledge is also the site of the All-Alone wreck. The All-Alone rests in 90 feet of water and is a 75-foot tugboat. This dive is an advanced dive since the tugboat is so far down in the water, and while it is not very large it is a popular dive since many larger species of sea life have chosen to make the remnants of the All-Alone their home. You'll see groupers, barracudas, snooks, and other large species while you're diving the All Alone site. Very little is known about the tugboat's history; the hull of the boat is split in two where it currently rests. Be sure to bring your camera when you dive the Ten-Fathom Ledge; if you're not an advanced diver you may want to stick to the shallower areas of the dive and try for the All-Alone when you're ready for deeper waters.